Hi everyone - I've been lurking for a while but finally got the push to actually sign up and post! One of my goals for the year has been to build a webapp that might be marginally useful to people other than me, so I've created a very basic Busfinder. 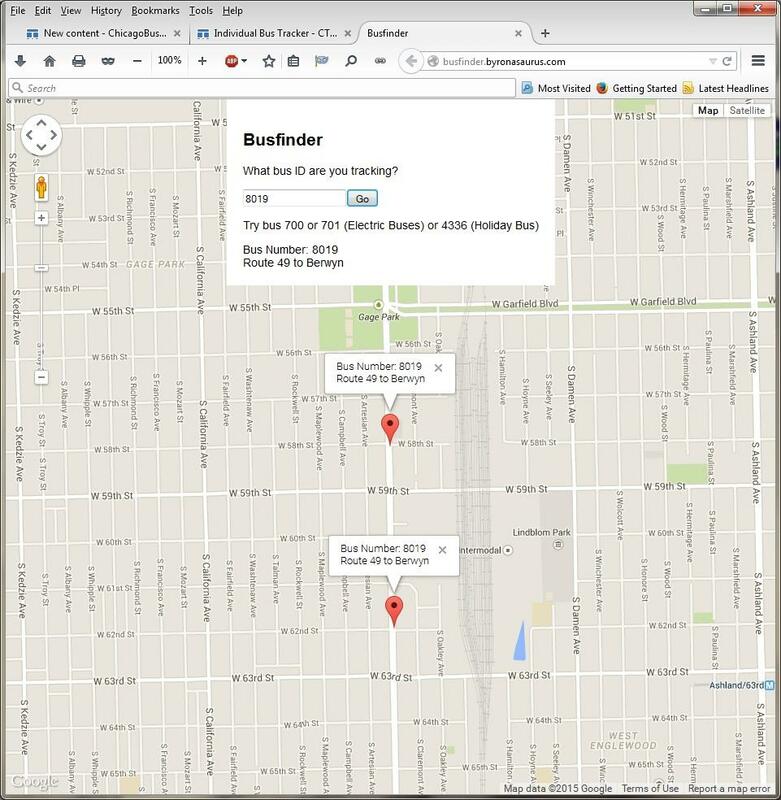 Busfinder allows you to input the bus ID (as shown painted on the buses and on the cta bus tracker). It will then put a pin on the map where the bus currently is. It's extremely barebones and sometimes buggy, but I wanted to get it out sooner rather than later. I figured that with the electric pilots (700, 701) and the holiday bus (4335) this might be something that people here might like. It's actually probably the same as the official holiday bus tracker, but extended to let you look up other buses too. First off, I want to say welcome mate!!! This is very fantastic and well thought off my goodness!!! If this in beta stages then that's fine. I wonder if you can tweak the UI when tracking buses i.e. movement without have to refresh the page or constantly clicking "Go"??? Other than that, keep up the good work mate! Very clever site you have there. It will come in handy for those that are looking for a particular bus. You think you will develop a android/iphone app for it? I would love to use this in the field and it would be really convenient. Keep up the good work!! I wish someone would develop a Pace app similar to the Transit Tracks app that would track Pace buses at the flip of a thumb. I use Transit Tracks way more than Bustracker because it is way more fast and convenient than going through 5 different web pages before I can learn anything and i can find out if a bus is at a particular intersection within 10-15 seconds. It's a very useful tool when bus hunting. I remember that I posted way back asking whether the CTA API is licensed to locate a particular rat infested bus ("rat infested" as hypothetical). O.K. now? Hello! I must say that this is a really good app, as others have said, in particular for those of us who are interested in where particular buses are. I'm using it now and it's been interesting in seeing where buses are at this moment. The only thing I was wondering if perhaps when further developing this app, if there's any way we could track particular run numbers that are on the routes? Personally speaking, I have become very interested lately in seeing what run numbers are on what route. Other than that, this is good and it's been useful so far in tracking buses. Good job! thanks friends for all your feedback and thoughts! @garmon757 i had created this assuming that people would want to know where a specific bus was at the moment, rather than as an ongoing tracker similar to the CTA bus tracker. I'll take a look and see what i want to do on that front. @bushunter i'm planning on ensuring that this site is mobile friendly/responsive. Since this is an exercise for me to practice, i'm not currently planning on doing an actual iOS/android app (yet?) but I'm just trying to make sure it uses all those fun new web techs that are relevant, and mobile is a big one! @busjack well if you know the bus number, you can now find out where this rat-infested vehicle is going! @buslover88 pretty sure that run numbers are included in the API, but I haven't looked much at that info yet. The Developer License Agreement states that use of the APIs is "for the sole purpose of assisting mass transportation (i.e., bus or rail) riders or in furtherance of promoting public transportation." If you can say that this promotes public transit, then it should be okay. Welcome to the forums, byroncheng! Nice work! It worked when I entered bus #s 700 and 701. Are you considering any other modifications/improvements? @MTRSP1900-CTA3200 yes! i would love to make some changes to make this look a little bit nicer and work a little bit more cleanly. Some changes based on some of the feedback that others above have shared, others which i just want to do as an exercise. Very nice job except I am getting an error message: No data found for parameter That bus is not running or does not exist. 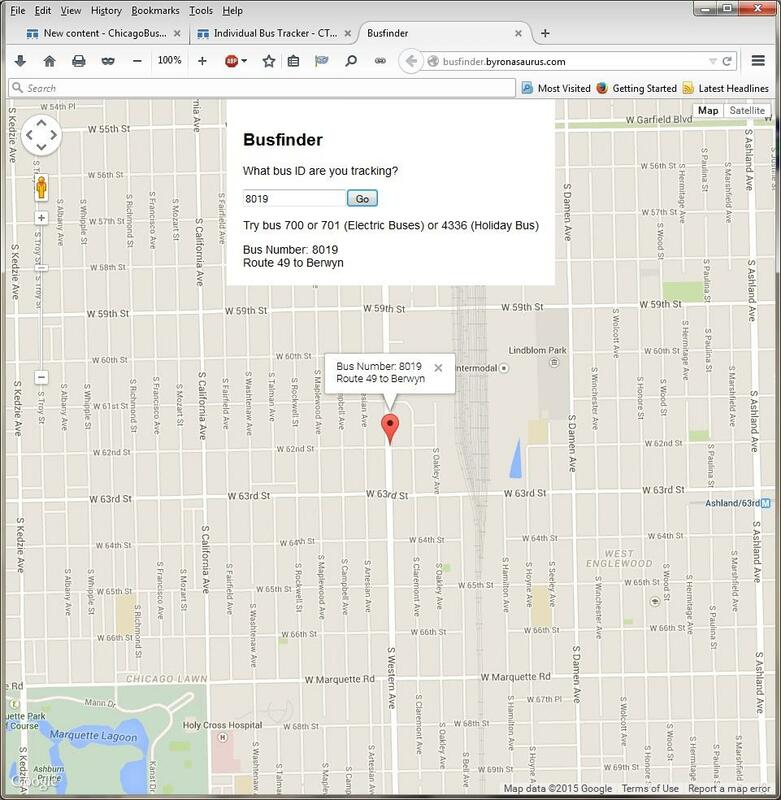 I don't know if you didn't realize that BusFinder does not refresh automatically, like BusTracker does. That was one of the comments noted in the thread, above. You have to reenter the query, and that doesn't erase the last position. Something was going on yesterday, Bustracker didn't show the buses at all. I'm assuming that was their last known position. Probably the buses were standing, but bustracker will drop the bus if after a certain amount of time it picks up it's not moving. Last week though #2018 was like that on the #70. Then all of all sudden it had arrived at my position as a ghost bus. Then it appeared going the other way as a ghost bus, so they could have been out there as ghost buses, but it's not likely. Just what is it with all the ghost buses? 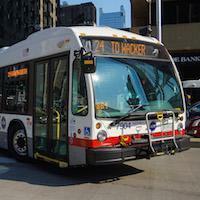 It appears that maybe 10% of the buses on 22 don't register on Bustracker many days. I know that when a 22 that's going back to NP gets to Howard & changes the destination sign, it is deleted from the tracker, but I see so many on Clark that aren't showing up. Almost every time I see that it's a 25 minute wait or longer, I'll get a ghost bus within a couple of minutes. Yeah, they have a serious problem with the tracker on the #77 too. If you wait for a bus at Central Park for instance or Kostner going west you'll never find out when the bus is really coming. You have to look at when it's coming at Spaulding and judge for yourself an additional 10 minutes, but really that doesn't help you if the bus has reached the blue line because it's then a ghost bus. Because like the other night it's saying there's 2 at Lamon and they are not there. Then it says buses are coming in 20 minutes when that's not true, the reality is it's a ghost bus from the Blue line to Cicero. What you are seeing is the next bus most likely. I had a ghost bus pick me up in 7 minutes when it said 20 and once it got past Lamon it was showing up. Isn't that totally crazy!! I thought I was the only one noticing that with the 22. I also have experienced it sometimes on the #9. But I seem to run across that issue more often than not on the #22. There's an early Saturday morning run I take southbound for example that almost never shows up on BusTracker anymore for about 3 to 4 months now. Hi friends, it's been a bit more than a year since i last popped in. Just wanted to let you know that I finally a) remembered what i wanted to do with this and b) had the time to do it. App should now be mobile friendly. I fixed up that bug where the old position stayed on screen as well. Hope this helps the few of you that are using it! The bus finder has been updated to automatically refresh once a minute. I might need to reduce the frequency since buses don't really update their position that frequently. New year = new updates! Some nice (I hope?) changes that might make the usability a bit better (like UI updates, speeding up autorefresh, clearing out some old junk). It looks even better on a phone now! Saw that @maths22 has also been getting ya'll some good stuff with the updated API. I don't think a lot of the data they pull makes sense to replicate here, but let me know if I'm wrong.